Let’s write equations for real-world situations and think about their solutions. For each relationship described, write an equation to represent the relationship. Grapes cost \$2.39 per pound. Bananas cost \$0.59 per pound. You have \$15 to spend on $g$ pounds of grapes and $b$ pounds of bananas. A savings account has \$50 in it at the start of the year and \$20 is deposited each week. After $x$ weeks, there are $y$ dollars in the account. 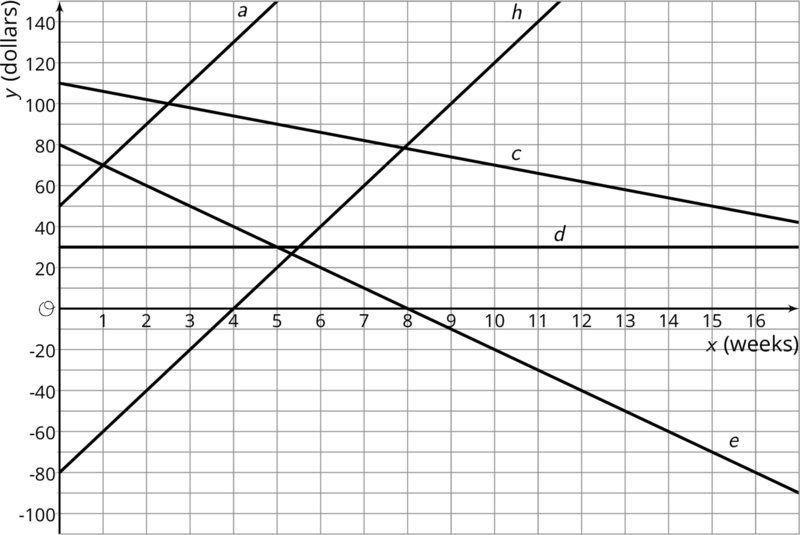 Each line represents one person’s weekly savings account balance from the start of the year. Choose one line and write a description of what happens to that person's account over the first 17 weeks of the year. Do not tell your group which line you chose. Share your story with your group and see if anyone can guess your line. Write an equation for each line on the graph. What do the slope, $m$, and vertical intercept, $b$, in each equation mean in the situation? For which equation is $(1,70)$ a solution? Interpret this solution in terms of your story. Predict the balance in each account after 20 weeks. The Fabulous Fish Market orders tilapia, which costs \$3 per pound, and salmon, which costs \$5 per pound. The market budgets \$210 to spend on this order each day. What are five different combinations of salmon and tilapia that the market can order? Define variables and write an equation representing the relationship between the amount of each fish bought and how much the market spends. Sketch a graph of the relationship. Label your axes. On your graph, plot and label the combinations A—F. Which of these combinations can the market order? Explain or show your reasoning. List two ways you can tell if a pair of numbers is a solution to an equation.